If you already have swab kits but haven’t yet got around to swabbing your Glen/s, please dig out the kit/s and “do the deed” and get the swabs & documentation sent to the Animal Health Trust as soon as possible, please. 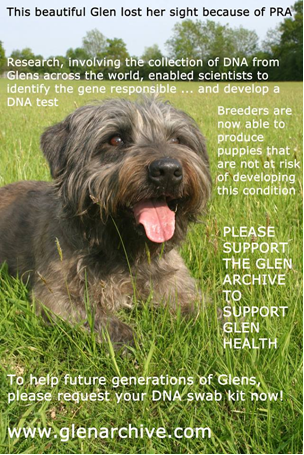 This entry was posted in General Glen Things, Health and tagged Glen DNA Archive, Glen health, Glen of Imaal Terrier by E-F-G. Bookmark the permalink. I tried to do this and make the donation but nothing happens when I click on the Blue button. I have emailed you about your query! For anyone else … the donate button on the Animal Health Trust page is orange (not blue!). Thank you for your support of the DNA Archive, Judi.